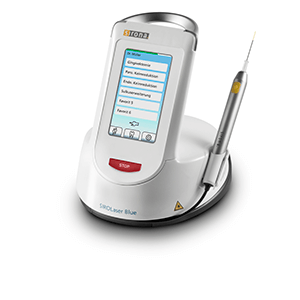 The dental laser uses the energy of various wavelengths of light to act as a cutting instrument or a vaporizer of tissue that it comes in contact with. Pocket Reduction – Gum Disease Treatment: Dental laser gum surgery can be used to promote healing of diseased gum pockets by eliminating or reducing the pocket depth and helping to restore healthy periodontal structures around the teeth. With certain types of lasers, regeneration and “new attachment” of the bone, ligaments, and gum connective tissue, can be accomplished. Bacteria levels in the gum pockets are significantly reduced by the dental laser. Crown Lengthening: Dental lasers can reshape gum tissue (soft tissue laser) and bone (hard tissue laser) to expose healthy, solid tooth structure (crown lengthening) to aid in the placement of dental restorations such as fillings and crowns. Esthetic Gum Contouring: Dental lasers can reshape gum tissue to expose additional tooth structure and improve the appearance of a “gummy” smile and short teeth. Frenectomy: A laser frenectomy is an ideal treatment option for children who have a very low connection of the fold of skin (frenum) between the two front teeth. The frenum oftentimes prevents proper closure of the space during orthodontic treatment. A laser frenectomy may also help to eliminate speech impediments, or difficulty with proper tooth brushing due to a low frenum. Soft Tissue Folds (Epulis): Dental lasers may be used for the painless removal of soft tissue folds often caused by ill-fitting dentures. Procedures performed using soft tissue dental lasers may not require stitches. Laser dentistry minimizes bleeding because the high-energy light beam aids in the clotting (coagulation)of exposed blood vessels, thus inhibiting blood loss. Wounds heal faster and periodontal tissues can be regenerated.